Celebrating our 30th School Year! Contests and Prizes Every Week. Visit us on Facebook. Like us to enter and to see what all the buzz is about! Tumble Bee Gymnastics is more than just tumbling. We offer an education in gymnastics, fitness and fun! Our bright, colorful facility is the perfect place for your child's Private Birthday Party for children 1-12yrs. Tumble Bee provides two wonderful, exciting and energetic party instructors. We also provide free invitations, paper products, and utensils. The Birthday Child receives a free gift and balloons. Reserve your party 2-3 months in advance. They book quickly!! NEW!!! USA GYMNASTICS FITNESS CLASS !!! "Our birthday parties are phenomenal!" Reserve Your Private Birthday Party Now! 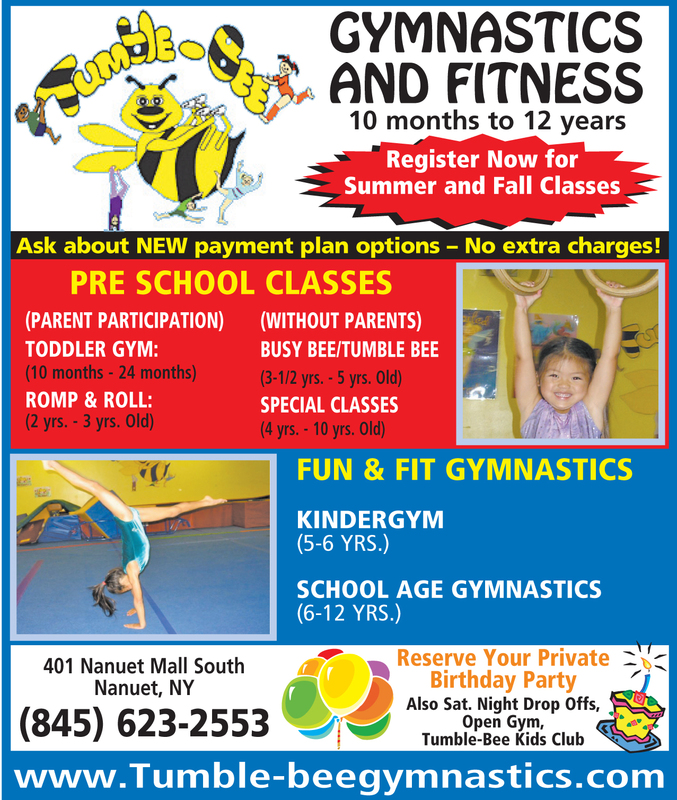 Tumble–Bee Toddler Gym is a wonderful introductory program for children ranging from 10 to 24 months. During this class, children have fun exploring the various skills they can accomplish on our toddler-size gym and play equipment. Gradually, older toddlers are introduced to gymnastics equipment as the school year progresses. The younger toddlers, aged 10 to 18 months, will be doing different things from the older toddlers, aged 18 - 24 months. Children must be either walking or ready to walk to join this class and parent participation is required (45 minutes). *Combo classes are Toddler Gym and Romp 'N Roll combined. The ages range from 12 months to 3 1/2 years. This class is the next level after Toddler Gym, and is open for enrollment to children ranging from 2 to 3 years of age. During this class, we work on gymnastic equipment and obstacle courses, as well as skills such as bouncing, balancing, throwing, and catching. This program has plenty of action, music, and fun! Parent participation is required (45 minutes). Busy Bees is a class for 3 and 4 year olds, where parents can watch their children through viewing windows in our gym. We include exciting weekly lesson plans, which are designed to develop specific skills to help children learn faster and easier. Children registering for this class must be 3 years old by September 1st and January 1st for semester 2. Tumble–Bees is a class developed for 4 and 5 year olds. At this developmental level, children are ready to learn more complex skills, and our exciting weekly lesson plans have been designed to build on your child's specific prerequisite knowledge. Children participate in all our gymnastic events and are introduced to our Fun & Fit Program. The Busy Bees and Tumble Bees go into the gym together for their warm up . After their warm up they divide into their age appropriate groups with their instructors. We have a 6:1 ratio of students to teachers. Please keep an eye on our monthly calendar for theme weeks, the children love and look forward to them. (50 minutes). This class is designed for kindergarten students that are 5 or 6 years of age. It offers more listening and critical thinking skills, including gymnastics skills, combinations, and short routines from our Fun & Fit Program. The emphasis is on learning through fun and participation. The children will receive their first Fun & Fit charts, this is for you to see what we are teaching your child and to follow their progress. (60 minutes). Level 1 — This class offers developmental and progressive gymnastics in a safe, positive, and fun environment for boys and girls ages 6 – 12. Each class works on skills and combinations from the Fun & Fit program. Children will perform these skills for parents and friends at the last class. Children must begin on level 1 of our Fun & Fit Program, and once level 1 is completed, they will move to level 2,—the Pre-Young Advanced class. (60 minutes). Level 2 — Pre-Young Advanced is for the young progressing gymnast. Level 1 must be completed before working on level 2. Each child is challenged and encouraged in order to progress at his/her own pace. Children will perform their new skills for parents and friends at the last class in June, (60 minutes). The following classes are by invitation only. You must earn your spot in the group by demonstrating your commitment to the practices and ability due to the difficulty of the skills . We still have a lot of fun but these classes are for the serious gymnasts who want to learn more. This class prepares the student for Team Tumble-Bee. You must have finished level 2 and be into level 3. All classes will work on routines and combinations which will be performed for parents and friends at the last class in June. Young advanced and Team will also be invited to perform at our Annual Exhibition in May. The Fun & Fit Gymnastics Program is a nationally recognized teaching system that is very popular with kids and parents, and is being used by gyms all around the country. The kids love getting the stars, certificates, and recognition, while the parents see how the program not only teaches gymnastics, but also increases self-confidence and self-esteem giving their children valuable goal setting skills. All Kindergarten Gym and School Age Gymnastics students will receive a poster to take home and put on their wall. The poster contains skills that are appropriate for the child's ability level, and match a curriculum card that the instructors have on each child. There are separate curriculum levels for children enrolled in Kindergym (5yrs-6yrs)and Progressive Boys / Girls ( School Age gymnastics 6yrs. and Up). On check off days , your child needs to know what the skill is and be able to demonstrate the skill 3 times in order to be checked off. The following week they will receive stars to put on their posters for all the skills they have mastered. Each child is challenged and progresses at their own pace. The Fun and Fit program let's you know what we are teaching your children and how they are progressing. Each level they finish, your child will receive a certificate and a large star with their name on it to be put on our Fun and Fit wall !!! This program was developed by USA GYMNASTICS for the prevention and intervention of childhood obesity. The goal of this program is to increase physical activity of children in a fun, safe, health-promoting environment. This program is apart of our Tumble Bee Kids Club drop offs offered throughout the year.